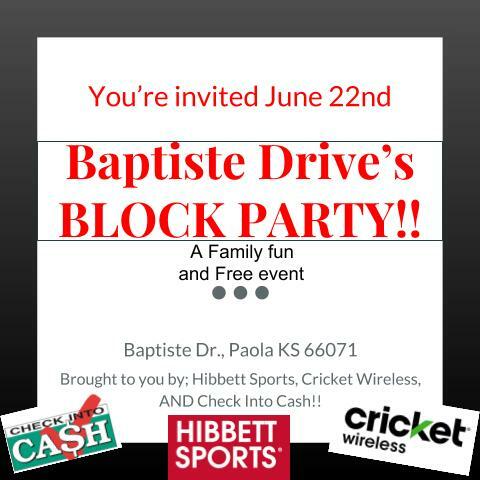 The #BaptisteBlockparty is back! Come on by for some bbq by Angry River BBQ, drinks, music, and a bounce house for the kids! Cricket Wireless is also having a raffle and all donations go towards the Miami County Cancer Foundation. The Party starts at 10:00AM, and finishes up at 4:00PM. Swing by and find out what all the fuss is about! Questions? Call the local Cricket Store at 913-259-4141. See you there! Free! We just ask for donations for the raffle, all proceeds go to the Miami County Cancer Foundation.